Crystal Lytle is the first to admit she didn’t know much about radon until just a few years ago. These days though, she can tell you just about anything about the cancer-causing gas that comes from the breakdown of uranium in the soil. DENVER -- Crystal Lytle is the first to admit she didn’t know much about radon until just a few years ago. These days though, she can tell you just about anything about the cancer-causing gas that comes from the breakdown of uranium in the soil. Just a few years ago, Lytle decided to switch career paths. For years, she worked in the health care industry. But when her friend offered her a job at Reliant Radon Solutions, Lytle jumped at the opportunity and became a certified radon mitigator. However, it wasn’t until she attended a conference that she became about spreading awareness about the dangers of radon. There, she met Johanna Carpine, a wife and mother who was battling Stage 4 lung cancer that doctors linked to exposure to radon. “She got up and told her story to everybody in the conference, four kids my kids age and younger, and it just shattered my heart knowing that she was battling Stage 4 lung cancer. From that day on I made it my mission to teach one person every day about radon,” Lytle said. Colorado is a radon heavy state because of the amount of uranium in the soil. The Environmental Protection Agency (EPA) recommends that homeowners test their homes to check their radon levels every two years. Many counties and cities offer discounted or even free radon test kits with detailed instructions about how to use them. “When you test for radon, you’re going to get your number back and the EPA states that anywhere above four is your action level that you need to mitigate,” Lytle said. Recent EPA studies have also shown that even lower levels of radon in the house can also cause cancer. That’s why Lytle recommends for households near that EPA-designated threshold to mitigate their house. “When you get a mitigation system it basically vacuums out the radon that’s in your home,” she said. Those systems can start at $950 and the prices can go up into the thousands depending on the layout of your home. “It is easy, it is relatively inexpensive when you compare it the cost of lung cancer,” Lytle said. Because each house is different, there is no one-size-fits-all solution for how to mitigate a home. Things like crawl spaces, concrete slabs and even cracks in the foundation can change how much radon comes into your home. Even the weather can affect how much radon makes its way in. “Snow causes the barometric pressure to go higher, which pushes more radon into the ground and then into your home,” Lytle said. That’s why it’s important for companies installing those mitigation systems to get it right. Currently, the state of Colorado does not regulate radon mitigation. That means the contractors who install those systems are not required to be licensed to do so. “We are working currently with legislation in the Capitol to try to get some more awareness going,” Lytle said. In the meantime, she says the burden is on the homeowners to make sure they are going with a reputable company. The first step she recommends for people to take is to search for a certified company on official national registries. You can find a link to those companies here . There are also some red flags she encourages people to look out for when they have chosen a contractor. Many reputable companies will ask to inspect the home to get an idea of the layout before providing an estimate for the mitigation system. Most systems only take a couple of days to install and you shouldn’t be required to leave your home while that is happening. “Make sure that they have labels. Labels are required by code to be put on the systems, there’s a lot of companies that are not certified and don’t follow this and you don’t have any idea,” she said. Once the system is installed, it should include a manometer which tells you if air is flowing through your system. If it does not, that could be another red flag. After the system is installed, Lytle says you should test for radon again between 48 hours and 30 days after to make sure the levels are going down. After that, homeowners are advised to test their levels every two years, even if the mitigation system has a way to test for radon. And, like any home appliance, the fan in the mitigation system has a shelf life. “It’s only going to last five to 10 years,” she said. Then the fan will not be as efficient in pulling radon out of the house and your levels could go up again. Finally, Lytle encourages anyone who is buying or selling a home to have it tested for radon, despite the fact that it is not required since Colorado isn’t regulated. “If you’re buying a home, you should test before you move in,” she said. 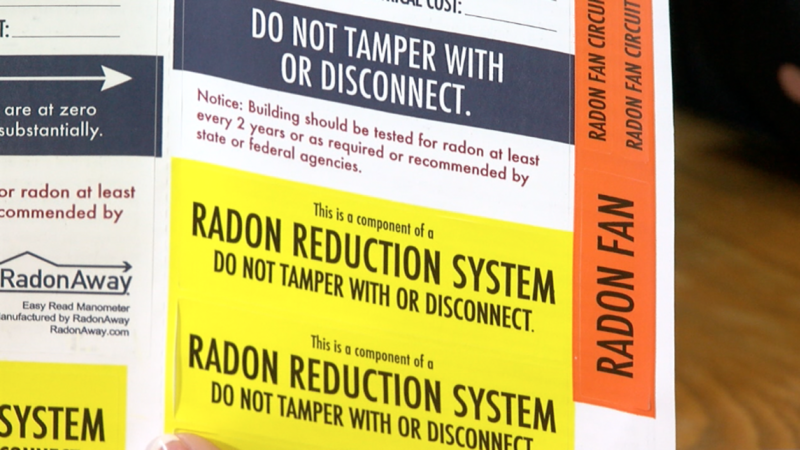 For those worried about the cost of a radon system, the state does offer some financial help. You can get more information about that program here .